ALPHEN, The Netherlands – Dutch audio rental provider Story Sound has recently completed what has unquestionably been the most diverse range of projects in the company’s history, all with a rig of HARMAN’s JBL VTX line arrays and Crown I-Tech HD amplifiers. “Since this summer’s festival season, our work roster has covered an unbelievable program—ranging from reinforcing illusionists, undertaking royal events, supporting the Four Day Marches [Vierdaagsefeesten] in Nijmegen and assisting with the pan-European launch of new industrial machinery,” said director Michael Story. “We have also worked with the Rotterdam Philharmonic Orchestra for the first time—in a free concert at the new Rotterdam Central Railway Station,” Story added. This has enabled the company to deploy its full range of front-line JBL line array systems, as appropriate, for each event. Over a period spanning more than 15 years, Story Sound has systematically adopted most generations of JBL’s large-format enclosures, dating back to the HLA; today, the company’s expanding new-generation VTX rig is complemented by its existing VERTEC® VT4887A, VT4886 and VRX rigs, which are rarely found in the warehouse. Of the shows that have given Story most satisfaction is the recent concert of the Rotterdam Philharmonic, where he used JBL’s revolutionary VRX system, ranks highest—the more so because a production manager, for whom they had successfully delivered a major project, had recommended them. Unusually, the concert, staged in the station’s entrance hall, was to honor 10 years of the Metro Rotterdam and was attended by at least 4000 curious passengers and passers-by. The Rotterdam Philharmonic played five classical pieces under the direction of conductor Jurjen Hempel, and Story Sound provided light, sound and staging. “The location was perfect for VRX,” said Story, adding that they rigged five VRX932LAP per side on each tower (using Genie lifts) with four VRX918S subs ground-stacked on the floor at each wing. The loudspeakers were powered by Crown I-Tech 5000HD and the sound was mixed on a Soundcraft Vi4 by Story Sound’s Wibo Vermeulen. The 98th International Four Days Marches in Nijmegen, where soldiers march through the town, saw the company working for promoters Matrixx, for whom they also annually reinforce the Emporium Festival (Nijmegen) and Dreamfields Festival (near Arnhem). 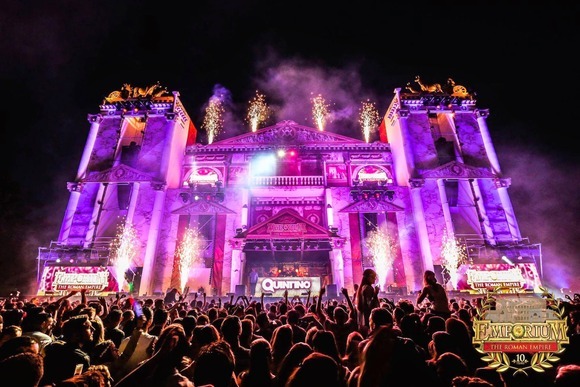 Story said that due to their calculations and predictions Matrixx were able to secure an additional contract for a new stage this year—and locations were set at Matrixx in the Park, Matrixx live at the Quay, the Festival Palace and the Stevens Church. For the main stage, Story Sound fielded 24 VTX V25 line array elements (12 per side) and 16 VTX S28 subs, set in a reverse cardioid pattern across the front. To this they added two delay towers, each containing six VTX V20 line array elements—with the entire system powered with Crown I-Tech 12000HD amplifiers. As for Emporium and Dreamfields, Story Sound provided a large number of systems—no fewer than 160 V25 tops and 122 S28 subs at Emporium alone. While Story Sound has its JBL VERTEC VT4886 on almost permanent hire with the Royal Netherlands Airforce Orchestra (Wibo Vermeulen again mixing on a Studer Vista 5SR, along with Remko Luijten), the production company has also deployed its VT4886 rig on the touring version of “Dreamgirls”, running from September 2014 through April 2015. “Again the sound has been perfect, with our VT4887A also delivering great results,” Story noted. Other events undertaken by Story Sound include shows in Germany for illusionist Hans Klok, where coverage for the larger shows is provided by a VTX system. Sound effects play a major role in this production and Story Sound’s system is fully backed up, with the whole show computer controlled. Meanwhile, at the other extreme, Story Sound has fielded its VERTEC VT4887A and VTX at events in both The Hague and Maastricht in commemoration of the 200 years celebration for the Dutch monarchy. Finally, another challenging tour of duty which saw Story Sound handle full technical production, including a complete video mapping exercise, was the pan-European introduction of NACCO Materials Handling Group’s new Hyster and Yale lines of lift trucks, where four clusters of four JBL VRX932LA-1 and VRX918S subs were used. All HARMAN Professional equipment is supplied in the Netherlands by Audio XL, headed by general manager, William Van Druten.